Family saga that chronicles four generations of women born into slavery in Louisiana. This book gave me not just food for thought but a banquet for thought. The first big thing my brain had to chew over was the family tree of the author tucked at the beginning of the book. Although this book is historical fiction, it is based on a significant amount of research that the author did on her own family. The thing about her family tree that really got me was to see how close the author, who resigned as a Vice-President of Sun Microsystems to take on this project, was to a generation born into slavery. Her great-grandmother was the first generation of her family that was not born into slavery. This brought a whole new dimension to my thoughts about those sociology classes I took in college that discussed the link between slavery and some of the difficulties faced by modern African-Americans. Aside from fueling my interests in social issues, this book also provided a very emotional, multi-generational story of a fantastic family of women. Although we all know, factually, the horrors that accompanied slavery and that continued after the Civil War, it is a whole different thing to experience these horrors through the eyes of characters that you have come to care so much about. The author fictionalizes her own family history beginning in the early 1800s when her family was enslaved in the south. It follows six generations of women through their emancipation and the "bleaching" of her family line. Excellent! Tademy recounts the history of several generations going back to the 1700's. Slaves in the South, children and spouses sold - a very hard life. This was every bit as good as Roots. Highly recommend. Couldn't put it down and was sorry when I finished it. The author went to a lot of trouble to research her family's history, and wrote a wonderful story based on her idea of how it might have been for the matriarchs of her family, as slaves, and as liberated black women struggling against racism. This will be a classic someday. A beautifully told family history about four generations of slave women on a Louisiana plantation in the nineteenth century. Lalita Tademy takes the dry dates and pieces of paper that go into genealogy research and crafts them into a story of strong women, family and the trials of slavery and freedom. 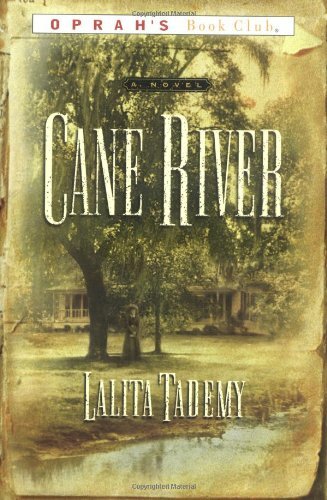 Her writing is powerful and poetic - 'She watched words float past, plump and ripe, before they burst just outside her line of vision' - but never purple, and she effortlessly recreates another time and place with evocative descriptions of Cane River in the 1800s. It is jarring to read about the lives of these vividly drawn 'characters' in a story, coming to know and care about them, only to turn the page and find a facsimile of a bill of sale for a slave auction and find their names listed, or look into the eyes of Narcisse and Emily in a photograph after imagining them. Combining fact and fiction, or grounding a poignant slave narrative in the shameful reality of history, somehow makes more of an impact than reference books and novels. But the saddest part of this family saga is not the vicious circle of illegitimate children or the 'bleaching of the line' when Suzette, Philomene and Emily had children with white men, whether by force of choice, but that nothing really changed for them after risking their lives for a hundred years to break free of slavery and provide for their families. In 1936, an elderly Emily takes the bus into town to buy her own snuff and some peppermint candy for her grandchildren. The store owner doesn't know her, but takes her for a white woman, long the ambition of her mother Philomene and her grandmother Suzette, because she is only one-quarter black. When another customer recognises her 'colour', however, the man turns on her and rudely makes her wait, at over seventy years of age, while he serves the white customers. She 'knows her place', he tells another woman who offers to let Emily go first. Emily leaves without her snuff, and returns to the house by the river - sitting at the front of the bus. The importance of colour, and the treatment of the women and the white fathers of their children, both distressed and angered me, more, if truth be told, than their lives on the plantation. Cane River is a wonderful novel, which I highly recommend. I learned a lot about the slave/plantation/small farmer experience of Creole Louisiana. Especially interesting are the details about the gens de couleur libre and the long line of interracial unions (both forced and chosen) among Tademy's ancestors. An important thread that runs from beginning to end in Cane River is the impact of skin color biases within the black community, and Tademy's family specifically. San Francisco Bay Area native Lalita Tademy has a unique story to tell about her family lineage, and I'm glad she took the time to research and write this novel. She convincingly portrays strong, interesting, complex women -- starting with her great-great-great-grandmother Suzette, whose nine-year-old fictionalized character launches the novel in 1834. Lalita Tademy brings a cast of memorable characters to life, with a great literary flair. I selected this novel for the February 2009 meeting of my library-based Mostly Literary Fiction Book Discussion Group. Book group participants described the book as a "page turner," and recounted many passages that moved them to tears. An excellent genre of fictional family history based on truth. This was a very compelling story. The characters were rich and often compelling. I did feel as if parts of the story were left untold, in some ways. the story was interesting, but the writing was not. I probably enjoyed 3/4 of this book. I got a bit bored at the end. As another reviewer has mentioned, it's really all birth, babies and death and although there was quite a bit on the struggles to become gens de coleur libre, which they eventually got. It didn't make much difference to them, the family was still treated with disdain by the 'white folks'. What a great experience to come to know your ancestors as Ms. Tademy did through writing this book. One of the most poignant scenes came at the end of the book when Emily goes shopping. She's treated with respect by a stranger, but then humiliated by a neighbor. It's hard to understand how we can be so unkind to each other. I LOVED this book. I loved Tademy's writing style, the storyline and characters, the fact that it's based on Tademy's ancestors and that she left the corporate world to focus on and write this book. It's just so amazing to see how much America and our attitudes and laws have changed over the past 100 or so years. Amazing really. A goodt book, although slow at times, about slaves, ex-slaves, Creoles, people of color, in Louisiana. I kept waiting for it to "get good", but it never quite arrived. I do think it is a good story for those who want to see slavery and the evolution of "emancipation" over three generations. An extraordinary amount of painstaking research went into this work of fiction based on the author's family history covering 4 generations living in rural Louisiana. As often happens in these multi generational epics, much time is spent on setting up the story and the introductory characters. The reader has a better knowledge and understanding of their lives than the later characters which are not drawn in such detail or given as much room for their stories to unfold. Nevertheless, I found the novel riveting and meticulously written. I enjoyed learning about the role of the Creoles and freedmen who lived side-by-side with the white French masters, the slaves and their mixed race children. Some readers may find this book slow going but as I have an interest in the era I enjoyed it. I thoroughly enjoyed the appended photos of the family members. Excellent book. Was moved by this story.. Well worth reading. Loved this book. A beautifully written historical memoir.